Place the chicken, breast-side down, on a board so the back is facing up and the drumsticks are pointing towards you. Using sharp kitchen scissors or chicken shears, cut closely along each side of the backbone. Remove and discard the backbone. Turn the chicken, breast-side up, and press down firmly on the breastbone to flatten the chicken. Arrange the garlic and lemon on an oven tray lined with non-stick baking paper. Top with the chicken, breast-side up, tucking in the wing tips. Butterflying a chicken allows it to roast more quickly and evenly. 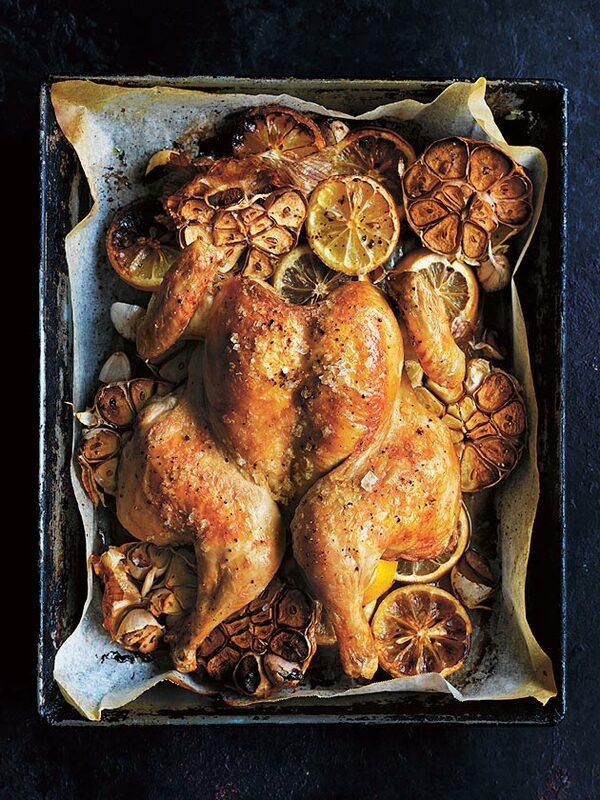 Placing the chicken on a ‘bed’ of lemon and garlic infuses it with amazing flavour as it roasts. That was the tastiest chicken we’ve eaten. The star rating does not seem to work when you tap on it. I’ve given it a 4 and my partner agrees that it was most enjoyable. I tried clicking on it again but no go. Thanks for sharing your wonderful recipes and I really enjoy your TV programs.